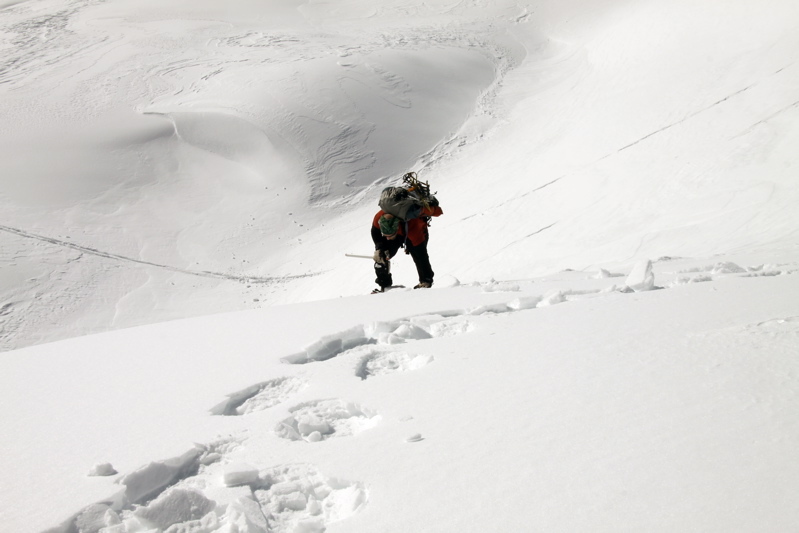 An exhilarating summit, especially in the winter. I can't believe it is only 100 miles from Seattle. The photographs were worth the cold fingers! Access is by Cascade River Road at Marblemount, WA off of Washington Highway 20. Turn in and park at the large car-park and gate at Milepost 20. 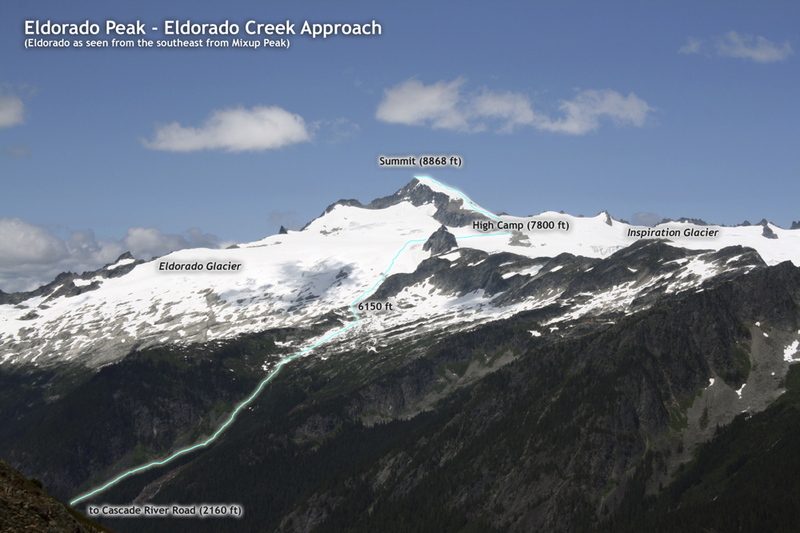 This is the trailhead for the Eldorado Creek Approach to Eldorado Peak, elev 2160 ft or so. There is a pretty good trail. But it starts on the opposite (north) side of Cascade River, directly across from the parking lot. Often, there is a log crossing about 300 meters downstream from the parking lot. Otherwise, you might have to wade. The start of the trail on the other side is marked by a large sign. Soon the path turns steeply uphill and the fun starts. 6700ft to go! 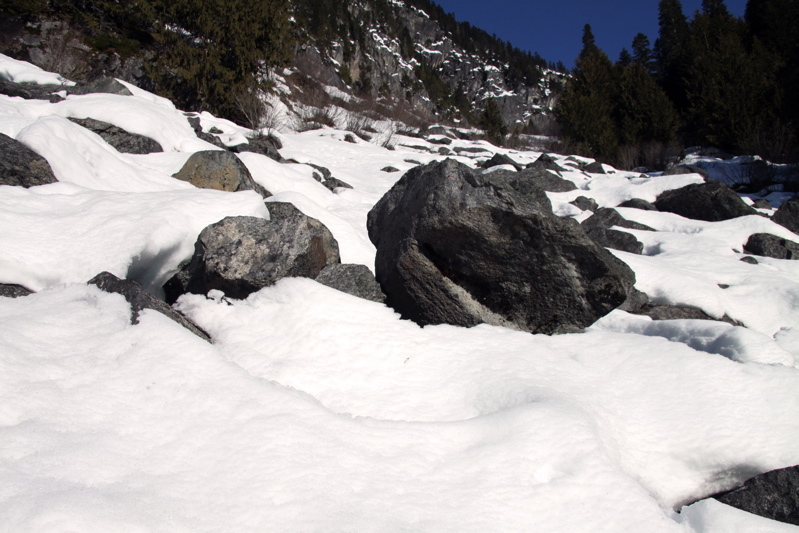 At 4000ft or so, you'll find a talus field (blissfully snowcovered in the winter). This field connects to a second larger field traversing up and right beneath a large and imposing granite arm (which turns into the Roush Creek - Eldorado Creek Ridge). Head up to small waterfalls at 5000ft and a steep muddy trail leads through the falls to something of an opening at 5400ft. Camp at 5400 ft or continue upwards. Continue up heather and rock slabs (or snow in early season or winter) until able to climb that same ridge around 6000ft or so. At 6150ft - where the ridge steepens - descend left into a class 3 gully into Roush Basin. The gully is marked by a large boulder just below the ridge crest. Do not descend the wrong gully - a number look promising - because they are down-slabby and nasty compared to the RIGHT one. 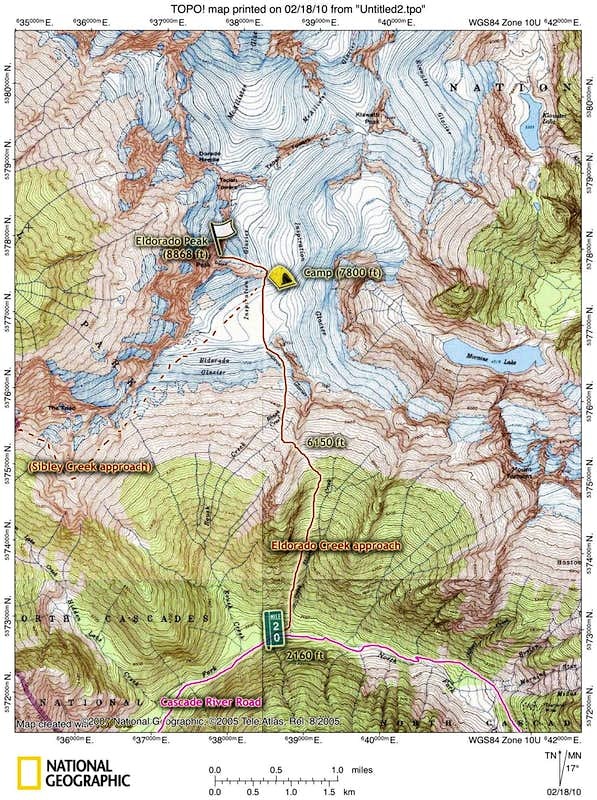 Once in Roush Basin, head towards the SE edge of the Eldorado Glacier. 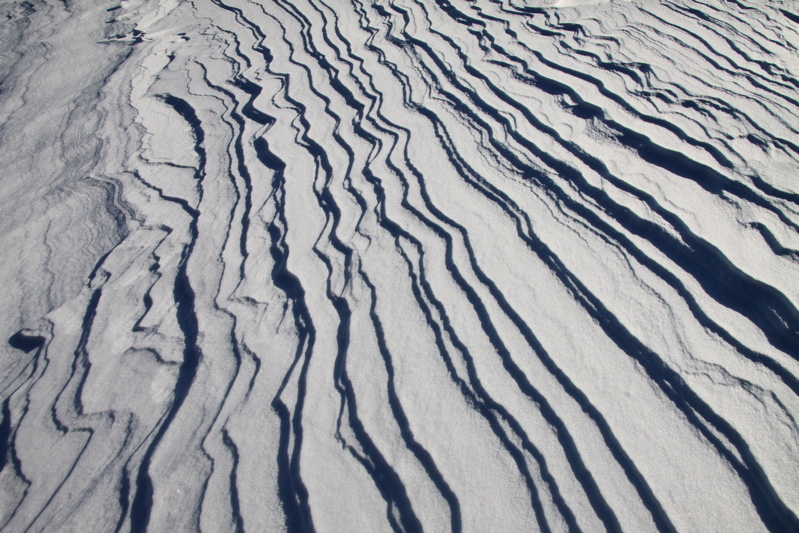 Snow slopes lead to a large flat saddle at 7500ft. There are good bivy sites here, or at a rock island at 7800ft at the base of Eldorado's East Ridge. 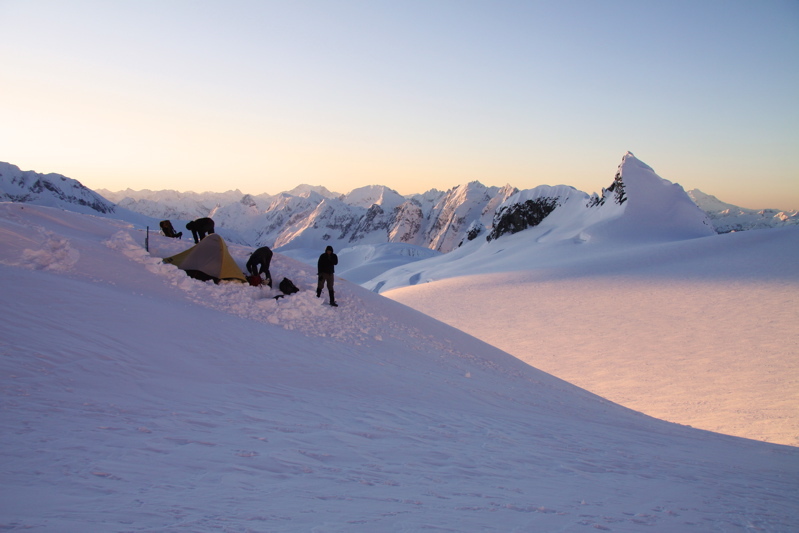 Pitch a tent, melt some water, and cook some grub. You have finally arrived, 7-10 hours from the parking lot. 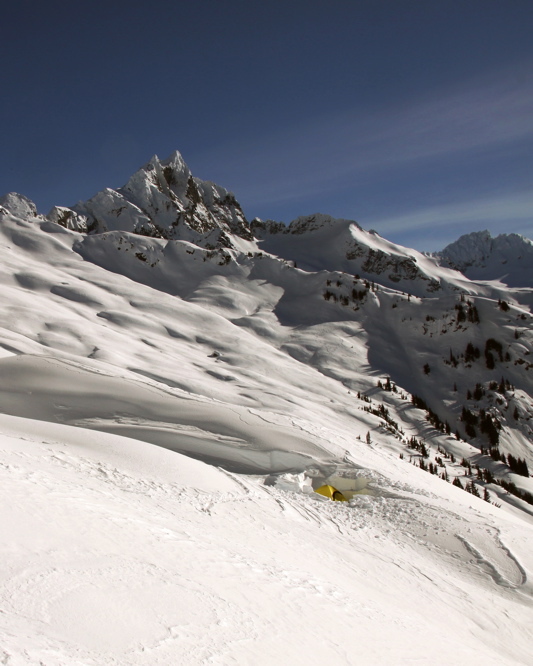 Masochists find this approach to be one of the highlights of the North Cascades! Always worth it! Note that the Sibley Creek approach is another alternative. 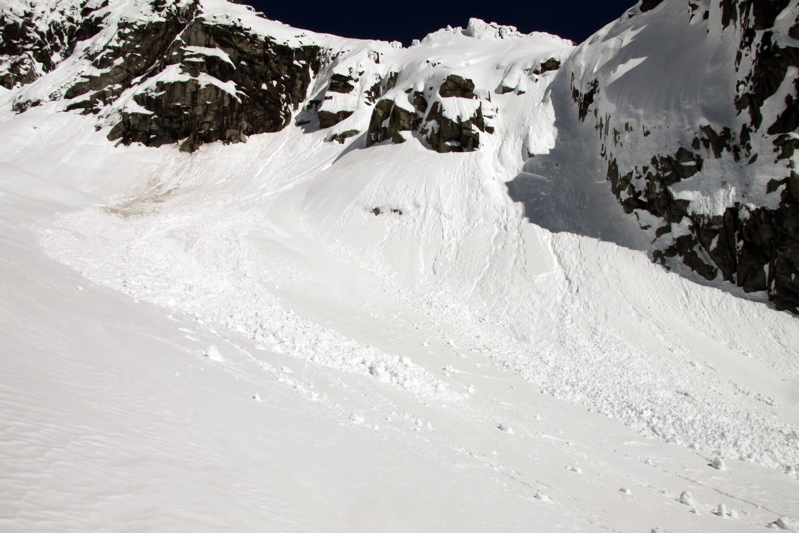 I've done this approach back in 2006 (click here for that trip report), and highly recommend it. It is not as direct as the Eldorado Creek Route, but it follows a beautiful and non-strenuous ridgeline speckled with flowers in the summer. 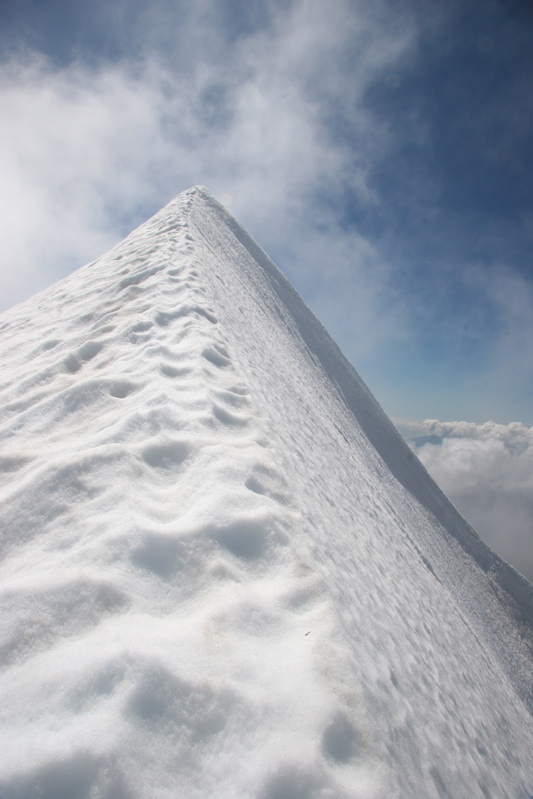 From high camp, the final 1200ft to the summit of Eldorado is straightforward. Basically just head northeast up the lower arm of the East Ridge. 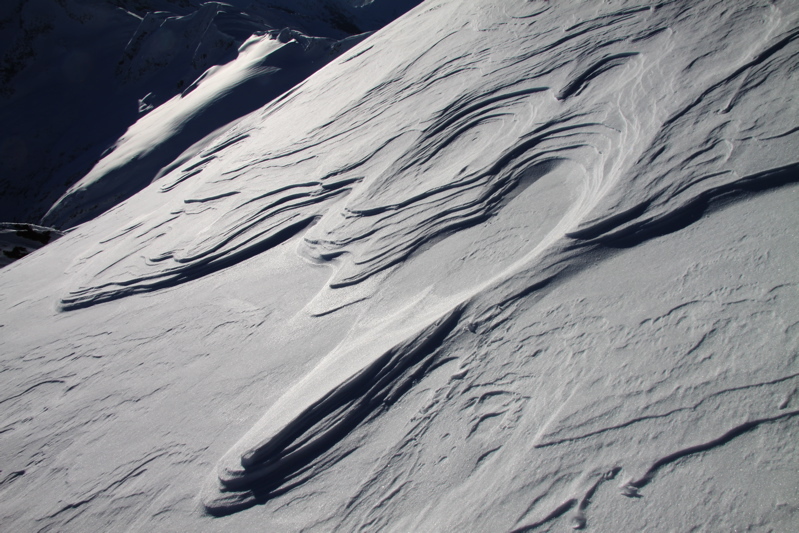 In the summer there is often a huge crevasse on the north side of that East Ridge about halfway up. 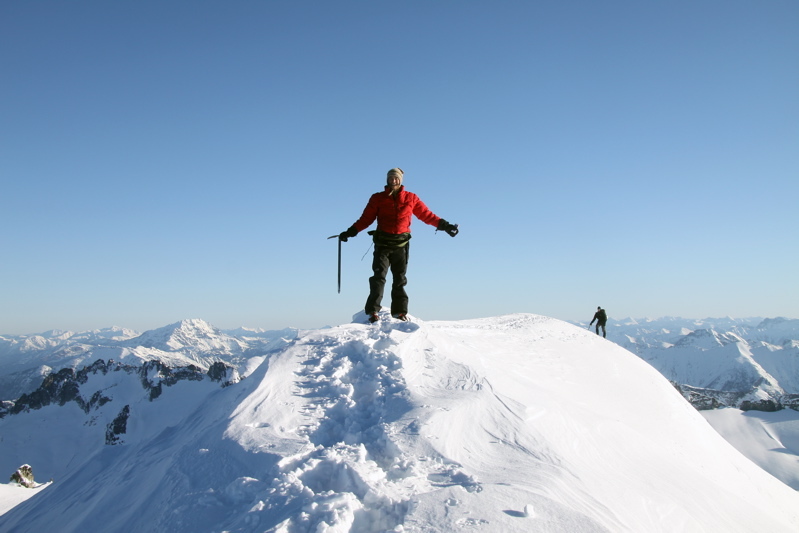 The final knife-edge snow-ridge to the summit is one of the most memorable and exhilarating in the Cascades! 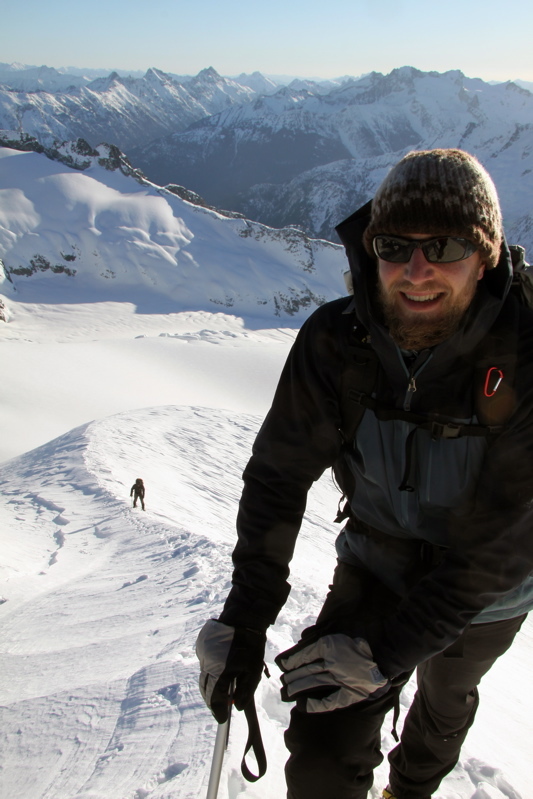 Okay, now for some photos from a wintertime snowshoe/climb/overnight of Eldorado! Usually in February, there is snow all the way down to the road. 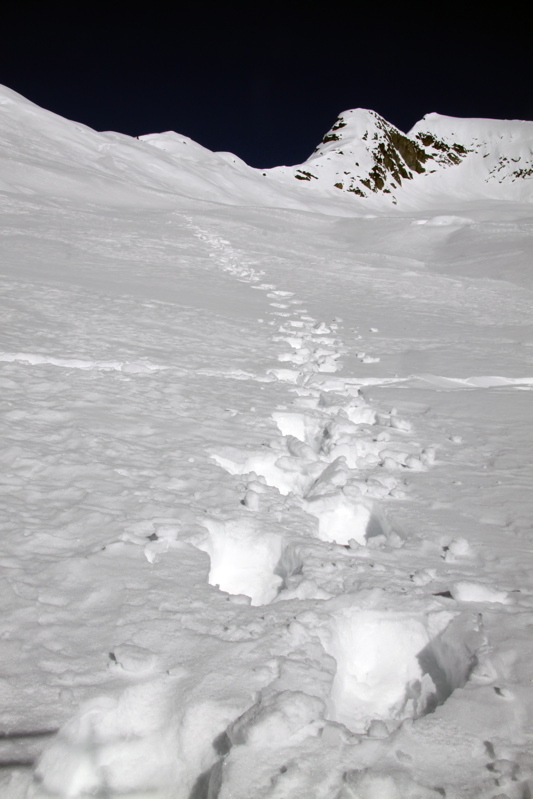 However, due to an incredibly mild winter, we did not hit snow until the first talus field at 4000ft. From here, we were on snowshoes all the way to high camp at 7500ft. 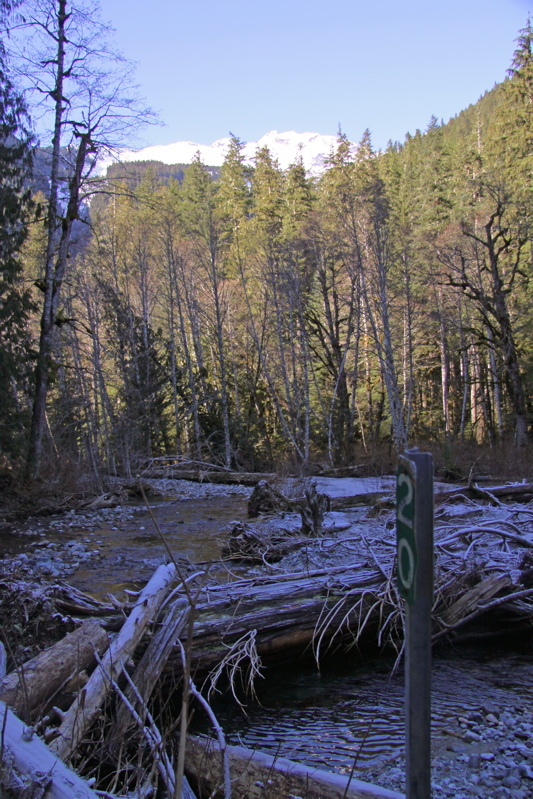 The trail starts at a log crossing at MP 20 at a clearing where you can see all the way to the summit of Eldorado. 6700ft to go! The snow made the talus fields much quicker. Some small slides due to the warm temperatures. Ascending to 6150ft crest, before descending other side into Roush Creek basin. Climber's camp at around 5400ft. Torment in background. Ascending snow somewhere in Roush Creek basin or on Eldorado Glacier (it's not all this steep). We dug out a camp at 7500ft. Another party arrived soon after us with the same idea. The lightshow was spectacular: from sunset to alpenglow to twilight to stars to moon to dawn to sunrise. I organized my photos in pairings. High camp at 7500ft. What a view! 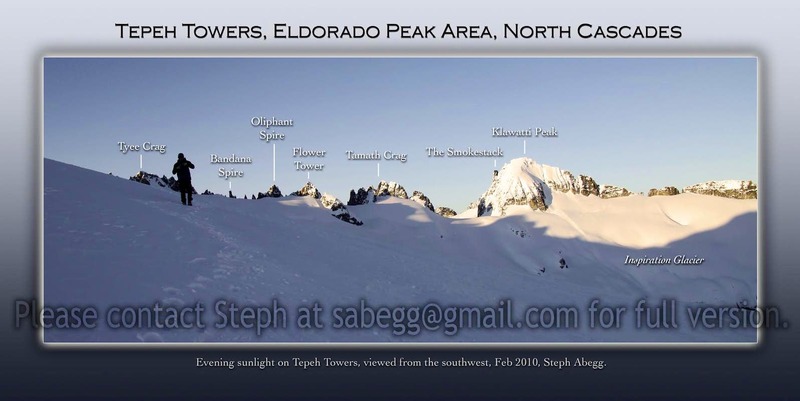 The Tepeh Towers north of Eldorado's summit. 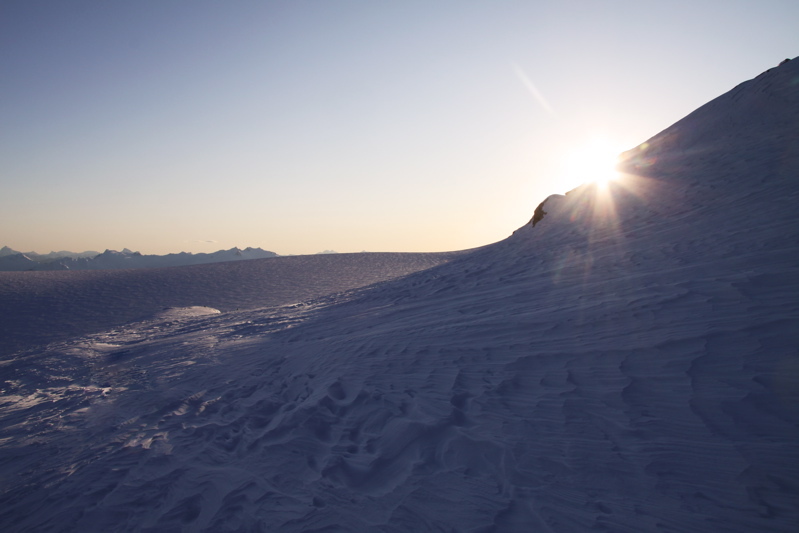 Nearing sunset over the Eldorado Glacier. 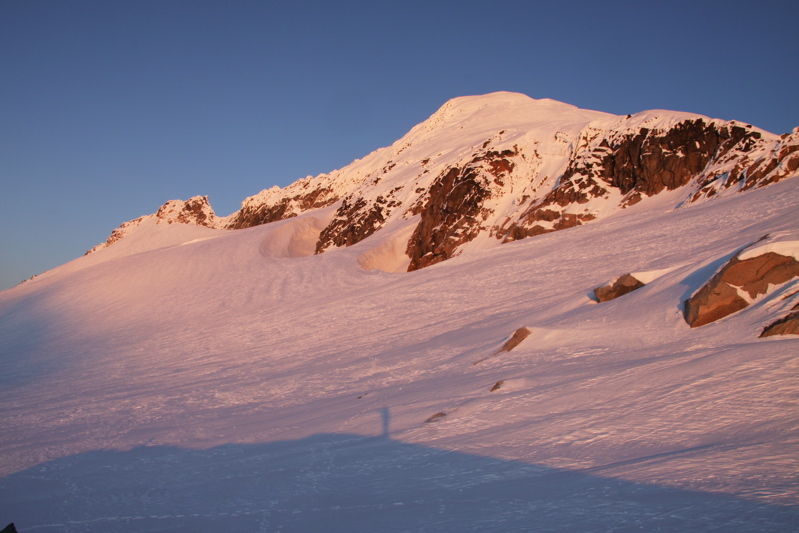 Sunrise just north (left) of Forbidden. 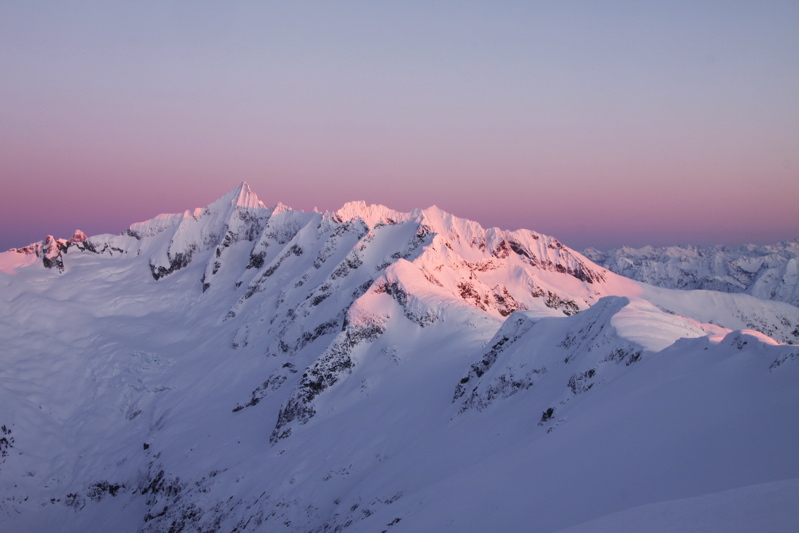 Alpenglow at sunset on Torment and Forbidden. The deeper blue near the horizon is actually the shadow of the Earth on the sky. Cool! Color location reversed at Dawn. 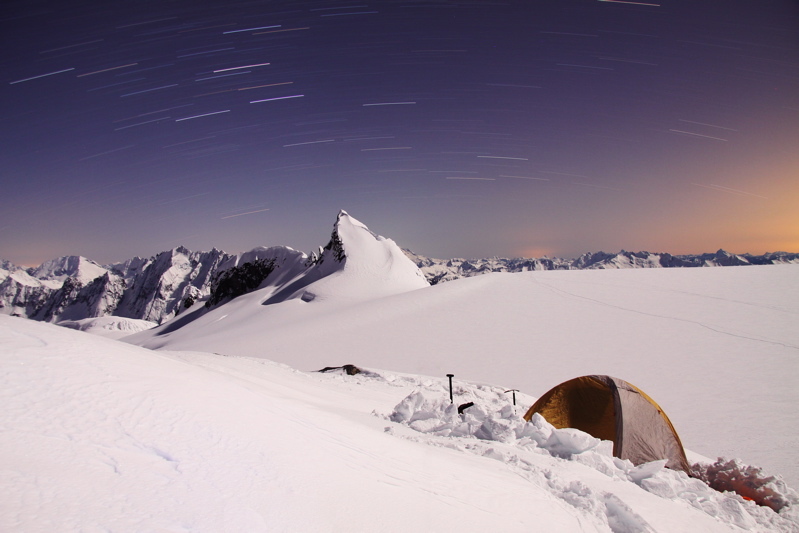 Stars over camp and Eldorado Glacier (20 minute exposure). 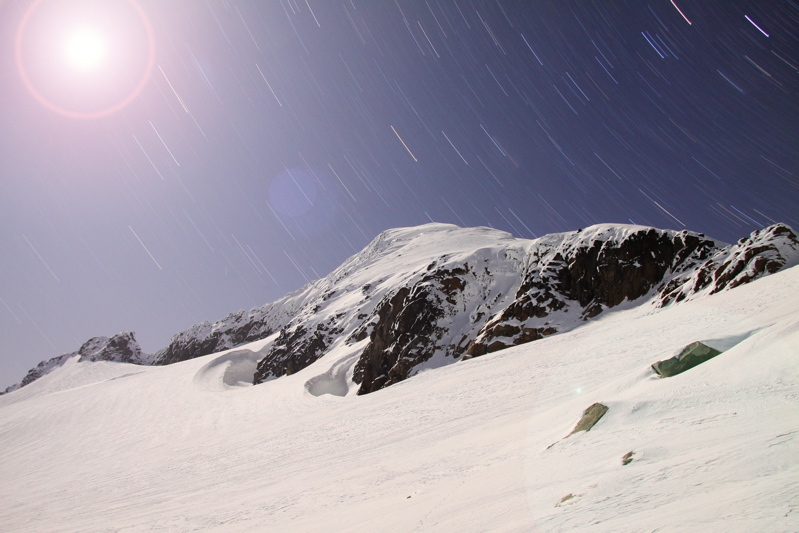 Moonlight and stars over Eldorado (20 minute exposure). 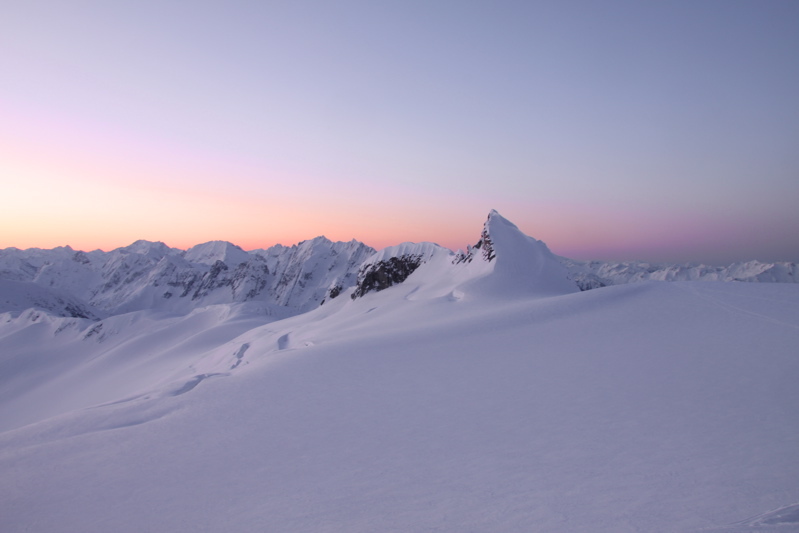 We woke up early to melt snow, spend 20 minutes shoving our feet into frozen boots, and take photos of a brilliant winter sunrise. 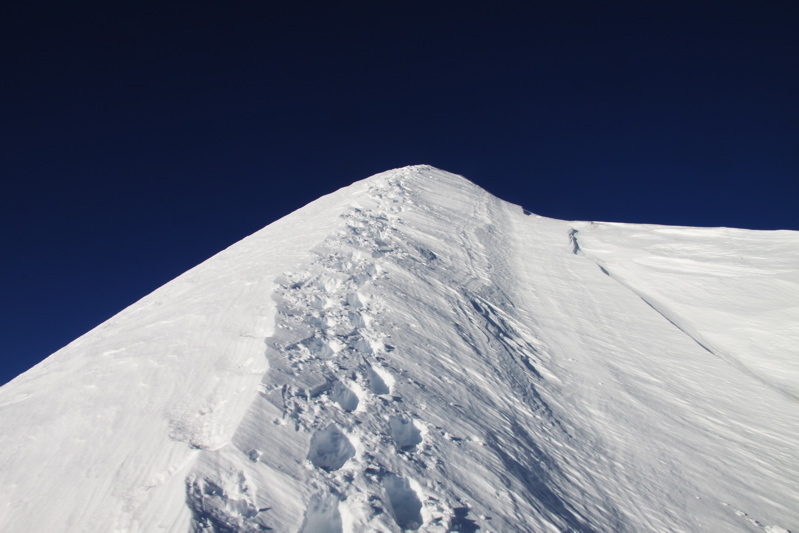 Then, we climbed to the summit of Eldorado, which took less than 1 hour from high camp. The summit ridgeline was much more rounded than the nearly-knife-edge snow arete it is in the summer. I'm not sure if this is typical of winter vs summer conditions, or if on some years winter conditions can be corniced and sharper. We enjoyed the great views and marveled at the continuing spring-like weather, and then began the long slog to the car. 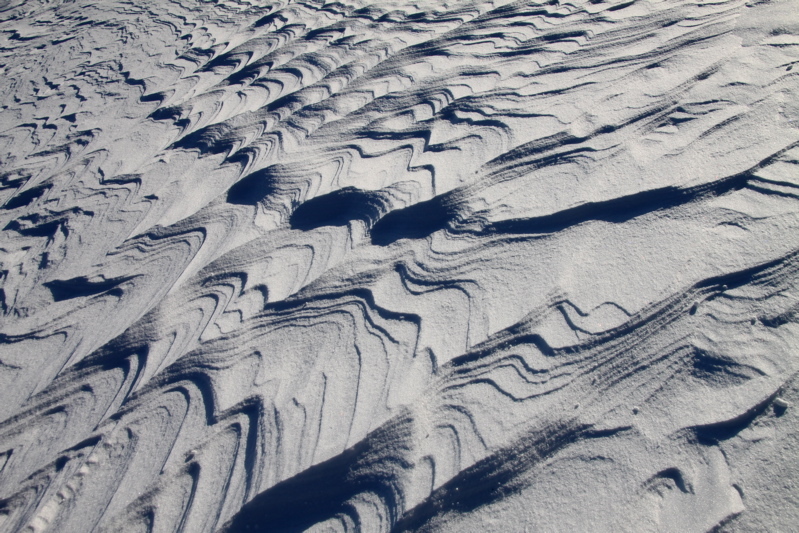 There were some cool formations in the snow to keep us entertained on the slog out. The other climbing party getting ready in the morning. Dave near the top of the summit ridge. 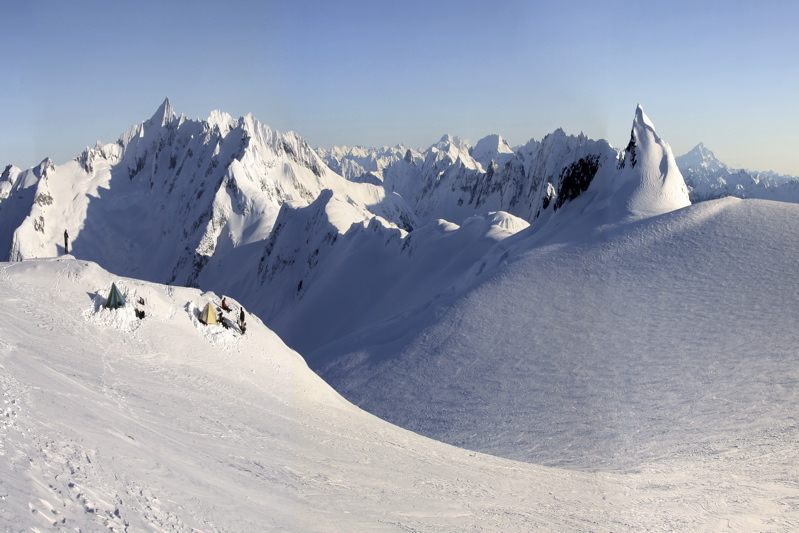 ....To: The summit ridge in Feb 2010 (winter conditions - always easier? or some years corniced and sharper? ).